HARDtalk interview: Has Thomas Piketty emerged unscathed? Posted at June 24, 2014, by Raleigh Addington, Comments Off on HARDtalk interview: Has Thomas Piketty emerged unscathed? Stephen Sackur, the popular presenter and moderator, interviewed French economist Thomas Piketty on BBC’s HARDtalk. Thomas’s book “Capital in the 21st Century” (Harvard University Press, 2014) has become an unlikely international best-seller. His thesis carries echoes of Karl Marx; modern capitalism, he believes, works in favour of entrenched wealth and exacerbates inequality. Recently, his research and conclusions have come under intense fire; has Thomas Piketty emerged unscathed? To book Stephen as a speaker, please contact Leo von Bülow-Quirk, at leovbq@chartwellpartners.co.uk or on 0044 (0) 20 7792 8000. Anybody interested in market capitalism and the explosive growth of emerging economies should listen to the excellent HARDtalk episode broadcast on BBC World this week (available here). Stephen Sackur is joined by Chandran Nair, founder of the Global Institute for Tomorrow and Raghuram Rajan, former IMF economist and now an economic adviser to the Indian prime minister, to discuss if free market capitalism will make or break Asia. To book Stephen as a speaker, please contact our Managing Partner, Leo von Bülow-Quirk, at leovbq@chartwellpartners.co.uk or on 0044 (0) 20 7792 8000. HARDtalk interview: Post-Kyoto consensus for IPPC? This great HARDtalk interview with Chair of the International Panel on Climate Change, Rajendra Pachauri, is certainly worth a watch. Presenter and interviewer Stephen Sackur raised some difficult issues, including questioning the IPPC’s credibility and the realism of shifting energy consumption towards renewable sources. Rajendra spoke of the importance of a post-Kyoto consensus on tackling climate change – deteriorating human health, poor agriculture, and more frequent and extreme floods and droughts are all risks if a world-wide solution is not forthcoming, he argued. 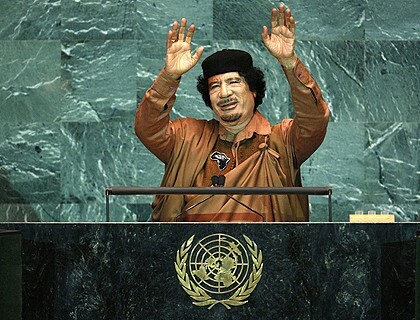 Is it a question of if or when for the Libyan dictator? Meanwhile, on the BBC’s HARDtalk , presenter Stephen Sackur interviewed Egyptian liberal intellectual Tarek Heggy, who advocates wholesale reform in the Middle East. During the discussion Tarek pointed out that Egyptians need ‘real jobs and real salaries’ to allay the deep seated socio-economic unrest. Change is necessary to cement the ideals of the revolution. Chartwell recently interviewed Marco Vicenzino on the Arab Spring and the death of Osama bin Laden. Marco argued that business prospects in the region would depend upon security and stability within powerful, strategic nations such as Egypt and Saudi Arabia. He provides geo-political risk analysis and regular commentary for global media outlets and is director of Global Strategy Project. Marco Vicenzino is an expert speaker on Middle Eastern politics and global geo-strategy. For more information on these speaker’s availability or speaking topics, please contact our Managing Partner, Leo von Bülow-Quirk, at leovbq@chartwellpartners.co.uk or on 0044 (0) 20 7792 8000.